WASHINGTON — A new bill by Nevada senators seeks to strengthen the state’s hand in rejecting nuclear waste burial at Yucca Mountain. Sens. Harry Reid and Dean Heller introduced the bill July 22 that would require the governor and local counties to sign off before the government could resume activities at the mothballed site 100 miles northwest of Las Vegas. It echoes a bill introduced in March that would prohibit the Yucca site from being licensed by the Nuclear Regulatory Commission without written consent from the Nevada governor. The new version aims to put an even earlier thumb on efforts to revive the nuclear waste repository that the Obama administration stopped funding in 2010. The Nevada senators submitted the bill without comment ahead of an Aug. 4 nuclear waste hearing scheduled by the Senate Energy and Natural Resources Committee. At the hearing, senators will be studying a bill to revamp the government’s nuclear waste program, including adopting a policy that calls for the government to obtain the consent of states before they can be considered for high-level nuclear waste facilities. 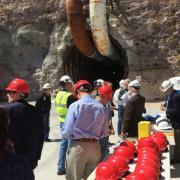 Nevada officials have expressed concerns about the bill, saying it appears to contain loopholes that would still allow Yucca Mountain to be considered.